This gallery is dedicated to images from the large mountain area around Kebnekaise, Sweden’s highest peak. 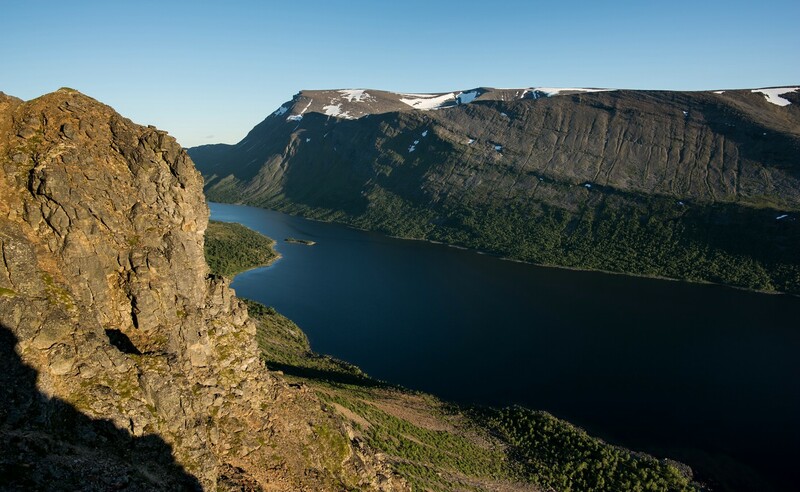 The area is situated in Lapland, in the very north of Sweden and close to the Norwegian border. The images were created during a three week hike in summer and a 10-day trip in winter on snowshoes. Some locations were visited in summer and in winter. 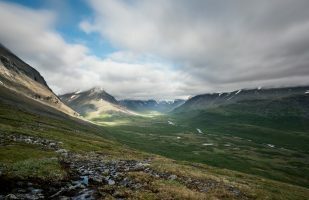 After reaching the Teusajaure hut from Vakkotavare I took a pathless detour from the Kungsleden trail for five days that led me through the more mountainous part of the Sjaunja nature reserve that also covers a lot of flatter terrain. 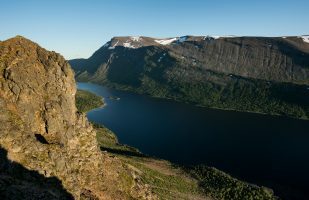 Sjaunja is part of the UNESCO world heritage site Laponia. Of particular interest to me were the large lakes Teusajaure and Kaitumjaure that are surrounded by mountain ranges. I did not encounter a single person during those five days. After hiking along Kungsleden for one and a half day – which certainly offers great landscape vistas as well – I turned east into Guobirvággi and then took the pass over to Tarfala. I encountered some inclement weather that required me to stay at Tarfala hut for an entire day. From Tarfala I took the route via Kaskasavagge to Visttasvággi, a green and lush valley surrounded by steep mountains. From there, the loop via Unna and Stuor Reaiddávággi is worth taking. In particular I liked my campsite above the Nallo hut which offered an awesome view along Stuor Reaiddávággi and towards Reaiddájávri. I followed Visttasvággi up to Alesjaure and from there I took the route towards Unna Allakas. From there, a detour to Norway led me to the beautiful lake Sealggajávri. I reached my destination Abisko via a pathless route from Unna Allakas to Kårsavagge and from there to the summit of Njulla where I spent my last night out in nature.